Wouldn't it be great if there were an easy way to put the good stuff back into the water that the RO filter took out? The iSpring RCC7AK 6-stage reverse osmosis system does just that! How does this filter remineralize reverse osmosis water? Is it the right fit for my needs? Where can I get one of these systems for a good price? How does it compare to the APEC ROES-PH75? I'm going to answer these questions and more in this review. If you don't want to read the whole article, you can skip to any question you like by clicking in the Quick Navigation below. And if you're really in a hurry and just want to check the price, you can go to Amazon here to check the price and availability. How Does the iSpring RCC7AK 6-Stage Reverse Osmosis System Work? How Much Water is Wasted in the Process? Does It Come With Everything I Need to Install It? How Often Do I Need to Replace the Filters and Where Can I Get Them? Can I Connect It to the Refrigerator? How Many Gallons Can This System Produce Per Day? How Much Water Pressure Does This Model Need? What Is the Flow Rate of the Faucet? What Does the Water Detector Do? Can I Filter Well Water with This? What Is the Size of the System? What Kind of Certification Does It Have? How Does the iSpring RCC7AK Compare to the APEC ROES-PH75? Where's the Best Place to Buy iSpring Reverse Osmosis Systems? iSpring Water Systems LLC is a family owned company in Alpharetta, Georgia that specializes in reverse osmosis filtration systems. Every reverse osmosis system works in basically the same way. It's connected to the cold water plumbing in your house, and water pressure forces the water through a series of carbon filters and a reverse osmosis membrane. It goes into a holding tank and then gets one more filtering on its way to the faucet. Where the RCC7AK differs is in the addition of an alkaline pH mineralization filter. This is the last stage the water passes through before it goes to the faucet. The alkaline filter uses mineral stones and calcite media to replenish mineral ions like calcium, magnesium, sodium, and potassium, which were removed during filtration. This raises the pH and changes it into alkali calcium ion water. In other words, it ionizes the water. In addition to raising the pH, the minerals give a little bit of flavor to the water that a lot of people prefer. It removes up to 99% of over 1,000 impurities such as arsenic, phthalates, pharmaceuticals, heavy metals, pesticides, herbicides, VOCs, endocrine disruptors, viruses, protozoa, and bacteria like e-coli, just to name a few. Of course, it takes out dirt, rust, chlorine, iron, and other things that make your water taste and smell nasty. What comes out the faucet is sparkling, great tasting water that can rival any bottled water on the market. Yes, it takes out 94-96% of the fluoride. Reverse osmosis is one of the few methods that are able to filter fluoride. You can read my Best Fluoride Water Filters: 2017 Buyers Guide to learn more about other filters that remove fluoride. Unfortunately, there is some water wasted whenever you use reverse osmosis. The waste to RO water ratio is 2:1 for this system. That means that for each gallon of clean water it makes, 2 gallons of water are wasted. This is actually a better ratio than many other brands. And remember it's only your drinking water we're talking about, which is a small percentage of the total amount of water you use on a daily basis. It's equivalent to a few toilet flushes a day. If you really hate the thought of wasting that water, you can always rig up a way to capture it and use it for watering your garden or cleaning. Yes. It comes with all the filters, tank, faucet, tubing, installation hardware, fittings, and a user manual. You will need a few basic tools and you might want to have a roll of Teflon tape on hand to wrap the fittings. It's easy to install. And to make it even easier, iSpring has plenty of helpful videos on their YouTube channel. Not all of the filters have the same life. The Stage 1, 2, 3, and 6 filters should be replaced every 3-6 months. 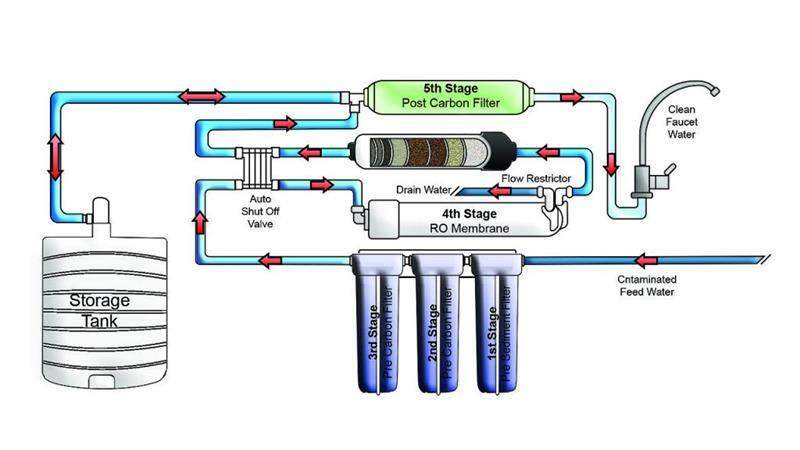 The Stage 4 reverse osmosis membrane will last 2-3 years. The Stage 5 filter should be replaced every 12 months. Rather than trying to remember which filter to buy when, you can also buy a 1-year or 3-year replacement pack. This will give you all the filters you need either for that period of time. It's more economical than buying the filters separately. The 3-year filter pack is the best value. You can buy them from the manufacturer or online. Yes, you can hook it up to the fridge, but you'll need to buy the iSpring ICEK refrigerator connection kit. Check to see if it's available at Amazon. Yes. All of the plastic parts are BPA and lead free. That's pretty important to most people. It can produce up to 75 gallons a day at a water pressure of 60 psi and at 77 degrees F. So if your water pressure is lower, you won't get quite that much in a day. It needs a minimum of 45 psi to work properly. If you have low water pressure, you should consider the iSpring RCC7P-AK. It's exactly the same as the RCC7AK with the addition of an electric pump to boost the flow of the water. Check the current price of the RCC7P-AK system with ​pump at Amazon here. You can fill containers at a rate of about 2 minutes per gallon. The tank holds 3.2 gallons. It has a pre-installed automatic shut-off valve and check valve, so the system will stop when the tank is full. This small device goes in the cabinet under the sink and sets off an alarm if it detects a leak. It's a nice feature, but if you're not home to hear the alarm, it's not going to do you much good. Yes, you can. If you have hard water, you might want to use a water softener to extend the life of the reverse osmosis filter. The dimensions are 14.5"w x 6"d x 18"h. It easily fits in the cabinet under most kitchen sinks. The iSpring RCC7AK is a WQA Gold Seal certified product for NSF/ANSI Standard 58. That means that you can be confident that it's made of the best materials and that it will do what the product packaging and literature claims it will do. These two models are almost identical. Both of them are 6-stage 75 gallon per day reverse osmosis systems with alkaline mineralization filters. They remove the same types of contaminants and work in exactly the same way. As you can see, there isn't a whole lot of difference between the two brands. The price is almost the same, too. Where they differ the most is in the life of the individual filters. The iSpring filters need to be changed more often than ​the APEC filters. However, the cost of a 1-year iSpring replacement pack is about 20% less than the cost of the corresponding APEC filters. So, you pay a little more to not have to replace them as often. Which APEC Reverse Osmosis Water Filter is Best? has additional information about the ROES-PH75 and other models from APEC, if you'd like to learn more. All iSpring products come with a 30-day money back guarantee, a 1 year manufacturer warranty, and lifetime technical support. iSpring sells directly to the public through a couple of online outlets as well as its own website. The iSpring RCC7AK is well made and effective. It's easy to install and easy to maintain. Add to that the WQA Gold Seal certification and 1-year warranty, and I don't think you can go wrong with this system. If you think this remineralizing reverse osmosis system fits the bill, head over to Amazon to check on the availability and current price.